Dr. Krempecki specializes in primary eye care for children and adults of all ages. he has experience with general eye care, identification and treatment of ocular disease, contact lens fitting, the applications of lenses for correction of visual deficiencies and offers exams in Spanish. Dr. Krempecki is licensed by the North Carolina State Board of Optometry. 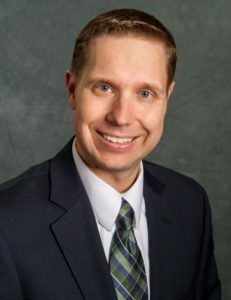 Dr. Krempecki attended Allegheny College, in Meadville, Pennsylvania, where he received his Bachelor of Science degree. He earned his Doctor of Optometry degree from Pennsylvania College of Optometry, in Philadelphia, Pennsylvania. He completed several externships including rotations at The Eye Institute in Philadelphia, PA, Boas Eye Clinic, Exton, PA, Eye Associates of Wilmington, P.A. in Wilmington, NC, Yukon-Kuskokwim Health Corporation in Bethel, AK, 305th Medical Group Optometry in McGuire Air Force Base, NJ and Bennett Eye Clinic in Mayfair, PA.
Dr. Krempecki is a member of the American Optometric Association as well as a member of the North Carolina State Optometric Society. Dr. Krempecki joined Asheville Eye Associates in 2017. Dr. Krempecki is a native of Greensburg, Pennsylvania. Dr. Krempecki has been in practice in optometry in North Carolina since 2009. Dr. Krempecki in his free time, he is an avid golfer, skier, and SCUBA diver, enjoy the outdoors, and aspires to learn tennis.